DES MOINES, IA - Iowa Barnstormers Head Coach and Director of Football Operations Mike Hohensee announced today that the team has been assigned Linebacker Darnell Carter. Carter will return for his third season with the Barnstormers. Carter (6-3, 245) joined the Barnstormers in 2012 after a solid 4 year career at the University of Virginia from 2006-2010. In 17 games with Iowa last season, he recorded 26 total tackles. More importantly, he won the Barnstormers special teams player of the year award for the second season in a row. "I'm excited to have Darnell back and anxious to see him take his game to another level," stated Hohensee. 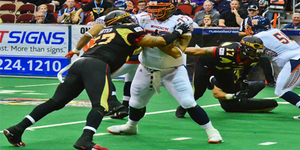 "His versatility is a valuable asset to the Barnstormers."